Some of the smartest people I know — including my friend Ivan, and what I’ve read/heard by Suzuki Roshi — excel at failing. They know how to fail in ways that allow the flow to continue, if you know what I’m saying. The failure is not crippling, but just part of taking on a difficult challenge. Generally speaking, I think that people with scientific minds (including serious meditators) are pretty good at failing happily. Failing in ways that reveal new opportunities, even as they foreclose the ones we thought we wanted. Endeavoring to improve on my ability to fail doesn’t mean tackling tasks that seem doomed from the start. That would be too easy! The kind of failure I’m talking about does not come cheap. I am invested. I want to succeed. Each attempt, each step, is made with confidence, commitment, and openness. Suzuki Roshi says that this is how we move toward enlightenment. Through repeating small moments of enlightenment — those moments of a letting-go mind, a mind that is being, not chasing — while at the same time working hard to deepen and strengthen our practice. I hope this is somewhat clear, what I’m trying to say. 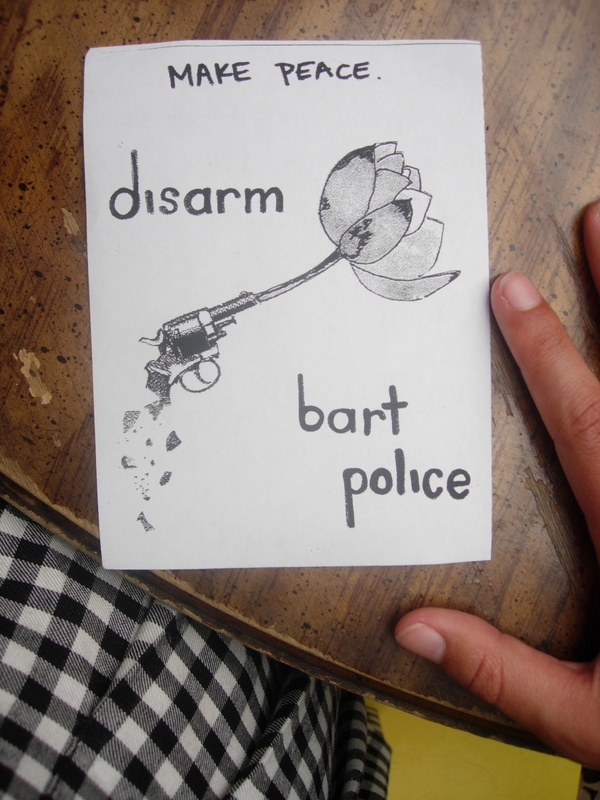 As an example of a recent, happy failure of mine, I wanted to share a letter I wrote to all the people I’d talked to with an interest in building a disarm BART police campaign. My intention in sending it was (1) to let folks know that I would no longer be pursuing the courses I’d proposed (for instance: organizing a direct action of civil disobedience for the day of Mehserle’s sentencing), and Why; and (2) to thank them for the inspiring connections we’d made in the course of the (eventual) failure. It felt good to write this letter, not only because I have a lot of admiration and goodwill toward each of the recipients (including those with whom I disagree politically), but also because it was an exercise in observing and accepting reality as it is — rather than as I would like it to be. A little inroad into rooting out dukkha. I’d love to know your thoughts, resonances, and criticisms. Over the past couple of months, I’ve been talking with BART workers, Oscar Grant movement organizers, Oakland peacekeepers, Marxist feminists, reverends, priests, meditators, lawyers, non-profiters, poets, anarchists, communists, peace activists, radicals, progressives, friends, and random strangers about the possibility of coalescing a campaign toward disarming the BART police. I and others envisioned this as one small step in aiding a shift from weaponized, racist, capitalist-serving security culture toward community-controlled safety initiatives, dual power, and restorative justice. I want to thank you, genuinely, for taking the time to talk with me, and welcoming me into your organizing spaces. I’ve been heartened to see such widespread passion for countering racist, militarized police violence — truly, one of the pillars of U.S. society — with forces for justice, love, and revolutionary transformation, grounded in the power of everyday people. Here’s the bad news. 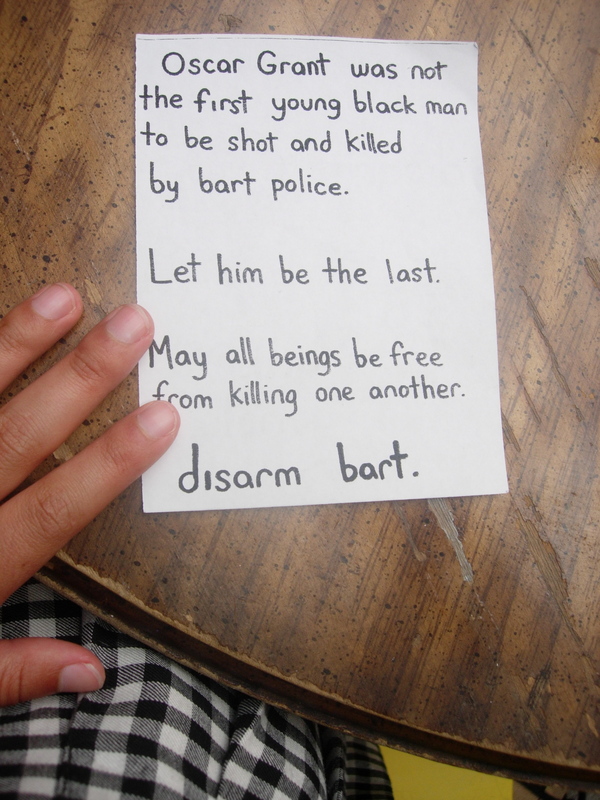 From what I’ve seen, there is not enough material support, organizational capacity, commonality of analysis, or general interest to sustain a people-powered disarm-BART campaign at this time. Many of us may care about this issue, and think it’s a good idea, but almost no one I’ve talked to seems to have the ability or desire to join a leadership team, and really commit to making something happen. Along the same lines, from what I can tell, we lack the resources to build for a non-violent, powerful, disruptive yet disciplined event to supplement the rally planned for the (now challenged) November 5th sentencing of Johannes Mehserle. If recent history tells us anything, the lack of structure around such a rally makes it ripe for frustration overboil, with an eye toward destroying property rather than strategically interrupting the production of the economy (i.e. through work stoppages, boycotts, and shutdowns). Most likely, the rally coordinators and growing band of trained peacekeepers will try to ‘protect’ community members from police repression and arrest. But again, if past events are any indication, such well-intentioned efforts may be interpreted as siding with the police in tamping down on the people’s expression of anger, without providing an effective, alternative channel for revolutionary energies. While not too disastrous, this situation is also clearly not ideal. The widely recognized “vacuum of leadership” around this police violence movement appears to have prevailed. We have been unable (as a loosely-knit Left community of targets and allies) to offer sustainable, strategic structure and discipline to the clear-sighted anger that has up til now expressed itself in symbolic rallies and fitful riots. On the other hand, we are probably no worse off than we were around July 8th, or January 2009. And out of this movement various community groups and labor unions (like the Onyx community safety team, the Oakland Peacekeepers, and ILWU Local 10 longshoremen), some with conflicting political views, have individually gathered strength and purpose. 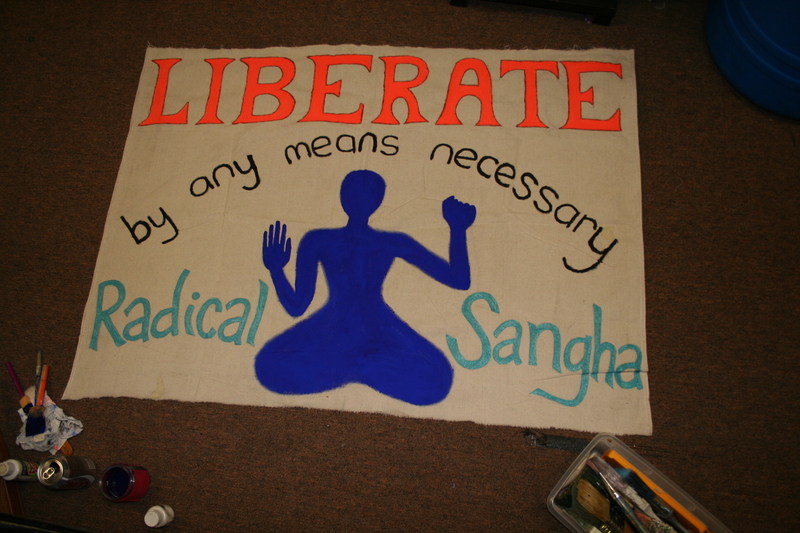 Recently I began gathering some friends into a group we call Bay Area Radical Sangha (BARS). The purpose of BARS is to provide a space for meditators with radical politics (structural critiques of the racist, heteropatriarchal, war-reliant capitalist system) to support one another in contemplative practice and radical political development. Having met or talked with all of you, I know for a fact that each one of you would have something wonderful to contribute to BARS! (And some of y’all are already down.) So if you are established in some sort of contemplative practice (doesn’t have to be Buddhist, though this is the foundation of the group), and would like to join us in building a committed, holistic center of radical political struggle, you would be most warmly welcomed and appreciated. We meet at 6:30pm on alternating Sundays and Tuesdays (so for the rest of October: Tuesday the 12th, Sunday the 17th, and Tuesday the 26th), at 234 Hyde Street in San Francisco, home of the Faithful Fools. I apologize if this seems tangential or opportunistic or something. But since BARS will probably be discussing the Grant/Mehserle case, and connections among racism, capitalism, and police brutality resistance over the next few weeks, I thought it might be a natural fit for building on our conversations. As Reverend Lawson and I discussed this week, the need for committed, long-term development of winning strategies for a failing peace movement seems great. Anyhow, thank you again for your time, kindness, insights, and work. It’s been a pleasure! Your use of language continues to lift me from my meditator’s cushion. Along with you, I aspire to continue my failing adventures. Your letter is most excellent. Clear, honest, and respectful. Thinking about dis-organized rallies, I remember being in the middle of an anti-KKK rally at the steps of our capitol building years ago. It was a hot day, the local KKK group had sequestered the top steps and were ranting on and on, while within the crowd, a fight broke out between several different groups of people with differing views and agendas. I remember looking behind the capitol stairs, and seeing several national guard troops peeking out, ready to pounce. It was a very tense scene, and there was no one ready to handle it in a way that would benefit everyone involved. Fortunately, the permit the Klan had gotten expired, they gave up the “stage,” and people began to leave. The arguing continued amongst a small group amongst the protesters, but nothing large-scale ever broke out, which is fortunate. Another half an hour, though, and I think it would have been a different story. Thanks, y’all! Yeah, that sounds like a scary scene, nathan. What are some of the best/most inspiring actions you’ve been to/participated in? hmm – one that was inspiring – if low key – was a silent, candlelight walk of anti-war protesters down a major street in St. Paul. There were several hundred of us, all holding candles, walking almost completely silently for a good mile. It was organized by a local peace group that was filled with Quakers, so I was digging the visual, public contemplative aspect. another would be an immigrant rights rally i attended with my entire ESL class. they all wrote their own signs, in English, and carried them during the rally. and afterwards we talked about the speeches we heard, wrote letters, and got the school to publicly stand behind a progressive national and state immigration policy overhaul.